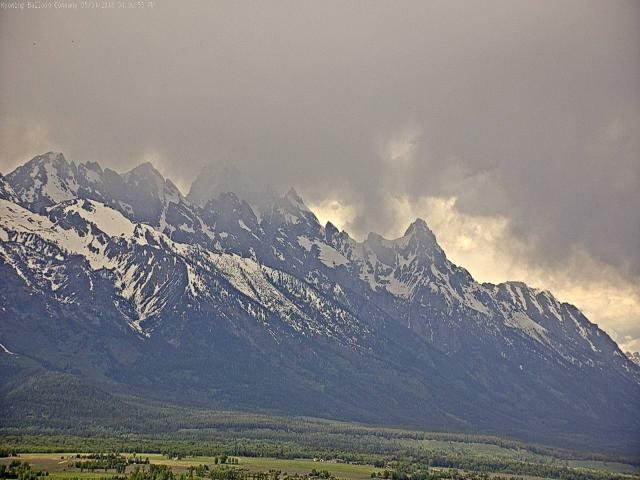 Image from Jack Hales cam wall above is of afternoon storms today over the Grand Teton - nothing like that visible from here today. Since tomorrow is the start of meteorological summer, I thought that I'd provide a quick summary of spring 2018 rainfall here at the house. Very, very little to report as March brought 0.02" and May followed with 0.01" - so a total of 0.03" for the season. This is easily the driest Spring here since I began keeping records mid-summer of 1999. Next two driest years were spring 2002 with 0.15" and then spring 2017 with 0.17". The wettest springs here were 2001 with 2.71" and then spring 2004 with 2.32". It's been a long time since we've seen those kind of wet springs here in southeastern Arizona. 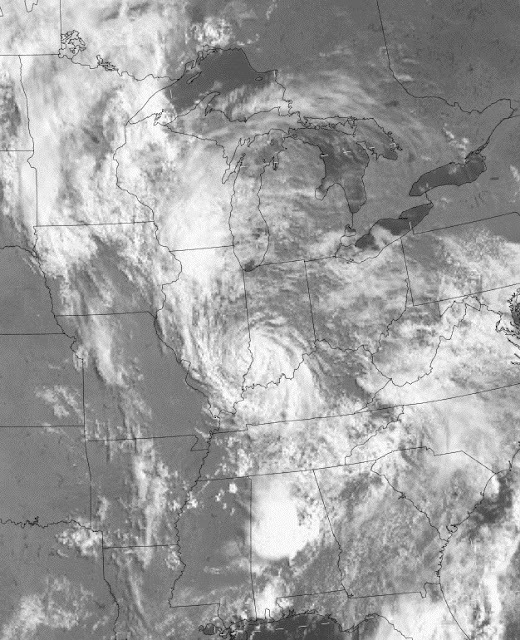 The remnant low that was TS Alberto is now centered north of Evansville, Indiana, moving toward the Great Lakes. 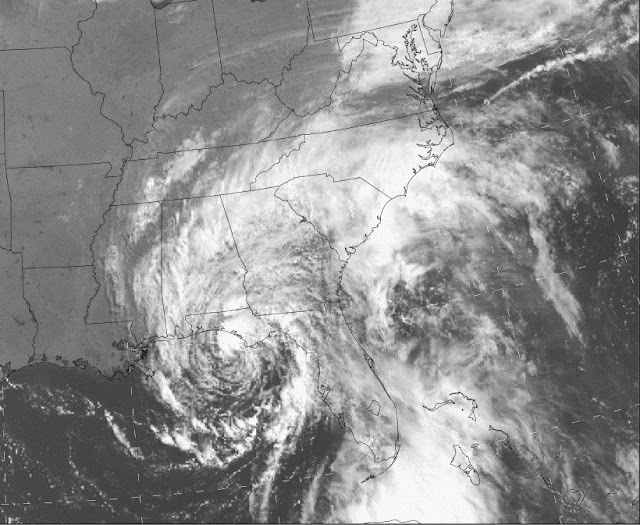 The cyclone is still quite organized and has a distinct lower tropospheric "eye." 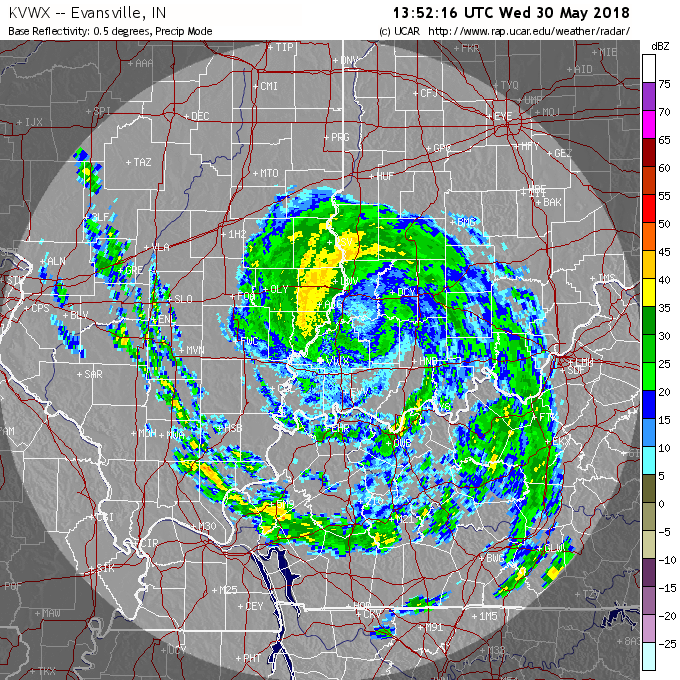 The images here are both from about 14 UTC this morning - above is visible satellite image and below is radar from Evansville. Little to report this part of world. I've grabbed the seven day operational GFS forecast of total precipitation for the eastern Pacific domain (above). Drought continues across the Southwest. 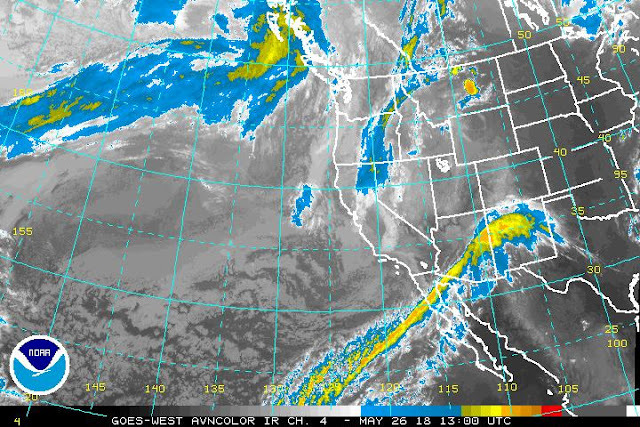 Convection develops slowly northward in Mexico, mostly along Continental Divide north of 20 degrees. 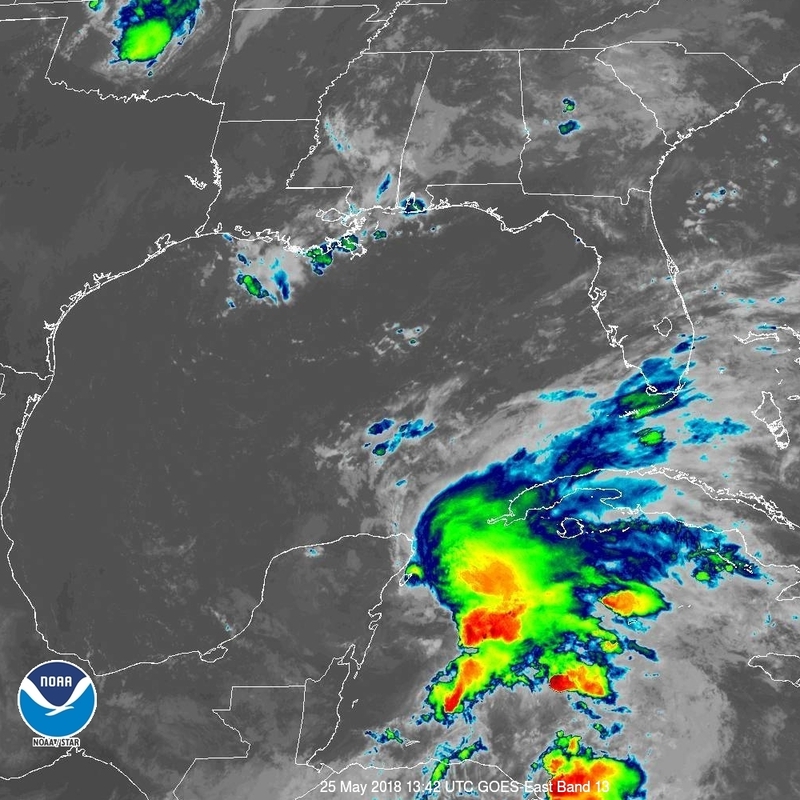 The swath of heavy precipitation in the southeast U.S. occurs in the short-term as storm Alberto comes ashore - north organized now but producing bands of showers and thunderstorms across Florida. The Indy 500 race thing is today - some chance of afternoon showers and thunderstorms there. Heavy, high and middle cloudiness moved in at sunset last evening and kept nighttime temperatures very warm - 6:00 am MST temperature here 70 F and at airport 74 F. The 13 UTC IR image above shows that upper cyclone over central California picked up a long plume of mid-to-high level clouds, now extending from tropics to northern New Mexico and covering southeast half of Arizona. Photos here were taken at sunrise from north side of the Rillito - top shows virga over western Catalinas while below shows iridescence to south side of rising sun. 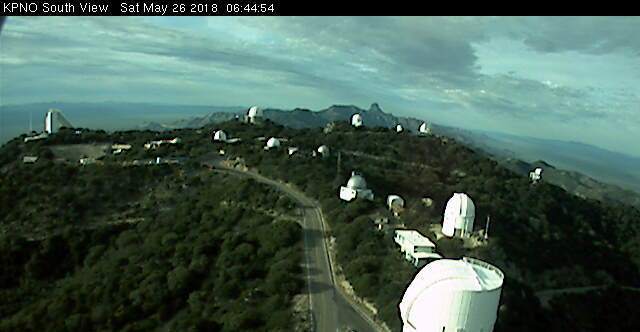 Bottom is south view from Kitt Peak a bit before 7:00 am. First - review of our drought conditions here at house: total rainfall over a bit more than last three months has been only 0.04 inches. The morning IR satellite image above shows a large area of deep convection southeast of Yucatan this morning. 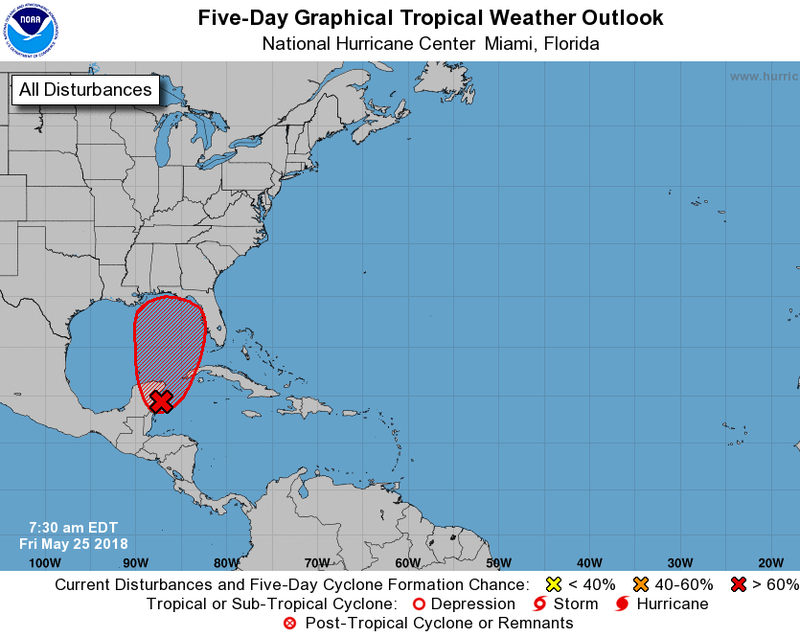 The morning outlook from NHC (below) indicates that this disturbance has a 90% chance of developing into a tropical depression or named storm as it moves northward toward the U.S. over the long Memorial Day weekend. Plot below is of detected CG flashes (from Atmo and Vaisala) for 12-hours ending at midnight last night. The west coast of Mexico remains quiet from Arizona to south of Cabo Corrientes. We are DRY. Temps are mostly above normal. A total of 12" snow v. 40" average. Our Walnut Creek, fed by springs, runs year round. However, this year half the springs are bone dry and the 4-6' wide creek is now only a foot wide. I have an Aspen grove of about 50 trees in our backyard. Over a dozen have died so I have taken to soaking them one by one with the garden hose. Our reservoirs are still full because 100 years ago our water district diverted most the Little Colorado River. It flows north to Colorado. Unfortunately, along the way, cattle and alfalfa growers are in trouble. Thanks for your blog update. I too look for T storms in NW Mexico and Pacific Tropical activity. It "always" rains here on July 4th. Fingers crossed and pounding on my Apache drum. Below is the current drought status map (issued today by Dept. of Agriculture) for western two-thirds of the country - as per Bill's report, Pinetop-Lakeside is an area experiencing exceptional drought. Extreme drought covers most of Arizona and New Mexico and extends across the Texas Panhandle into western Oklahoma. Drought conditions cover almost all of the Colorado and Rio Grande watersheds. A very grim situation for both Southwest water supplies and dangerous wildfire potentials. As similar plot below (but for 24-hours ending at 1:00 am today) shows there were even isolated thunderstorms over northwest Arizona. 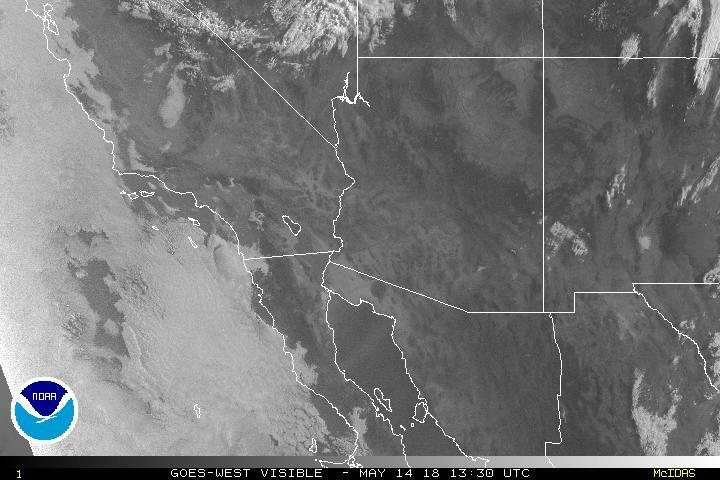 That's Lake Mead near center of graphic. 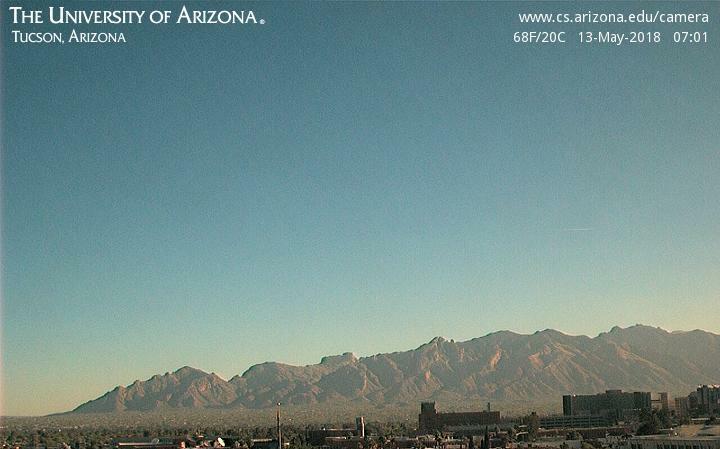 The webcam image from the CFHT you posted this morning is looking close to due east. This would place the glow from Hilo on the right (SE) and the rising sun to the left (NE). 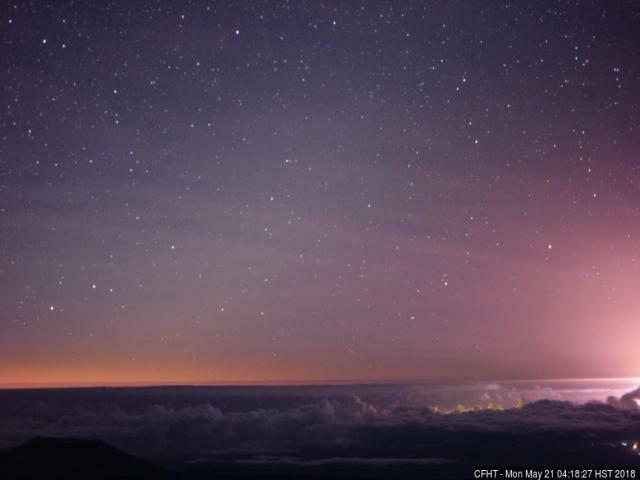 Carl Hergenrother sent the message above re my interpretation of yesterday's image from Mauna Kea (above is view this am). Since the camera is looking east, Hilo would be to the right of image, so perhaps (since Hilo appears to be under clouds this morning), the brighter glow might be associated with the eruption. Satellite view of Big Island below shows locations of Hilo and also of Pahoa - which has been seriously impacted by the lava flows. 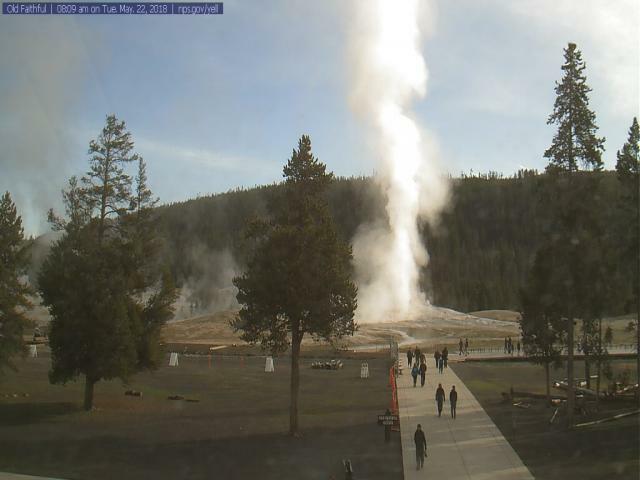 Down at bottom is Old Faithful doing its thing this morning in Yellowstone NP. Cam images here from Jack Hales website. This week we have a weak 500 mb trough over the West this morning inland from the coast. This system will move northeastward and weaken during the week. This will bring us high temperatures in low 90s early but heading toward low 100s by the weekend. Dry but with several windy days - so little change. Forecast above is from the 06 UTC WRF GFS run at Atmo on 5.4 km grid - total precipitation through next Monday morning almost totally avoids the entire state. 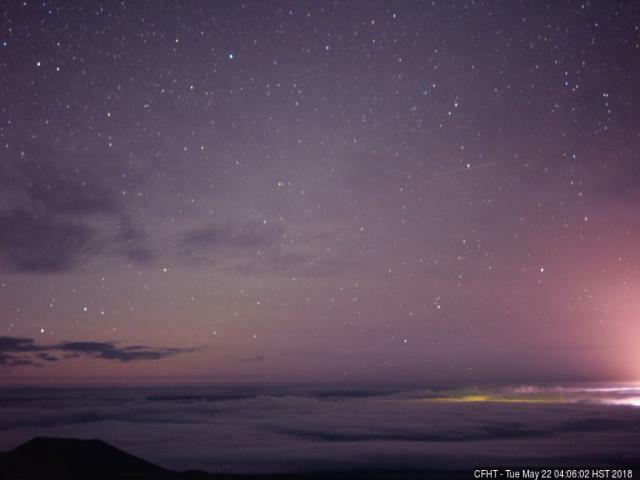 Below is early morning webcam (from Jack Hales web page) view from the CFHT (Canada-France-Hawaii-Telescope) site on Mauna Kea - but I'm not sure of exact direction of the view. I think glow to left is from Hilo and the rising sun to right. No obvious indication of the on-going eruption. But corrections appreciated. Here is my attempt at putting together the rain event mentioned in previous post. The GEFS QPF plumes for Greeley, Colardo, are repeated above. Below I fitted together two NWS QPE maps - top is for 24-hours ending 12 UTC yesterday and bottom is for 24-hours ending 12 UTC today. Color bar for the maps is in middle below. While it is hard to "eyeball" the totals, it looks to me like the GEFS means and also the ranges, were pretty good - with highest point rains resulting from heavy thunderstorms with hail. Clearly the operational GFS forecasts (blue) were extremely too wet. 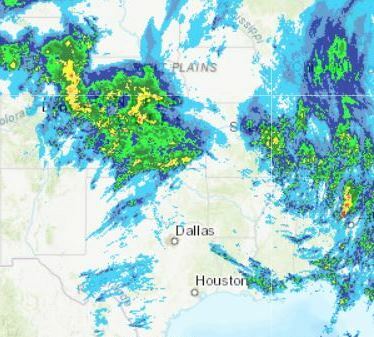 There was flooding in northeast Colorado, southeast Wyoming, and the Nebraska Panhandle. Nothing really comparable around here since last July. Interestingly, the most significant rain event was for the 24-hours ending this morning, and stretched from west Texas into Missouri. These heavy rains were associated with severe thunderstorms and a nighttime to early morning MCS. Here in north Tucson, the mornings have been very pleasant for walking this week, with light winds and temperatures down in mid-to-low 50s. Afternoon have continued dry, with temperatures in the 90s, and with some windy periods. There is some weather of interest up along the northern Colorado Front Range however. 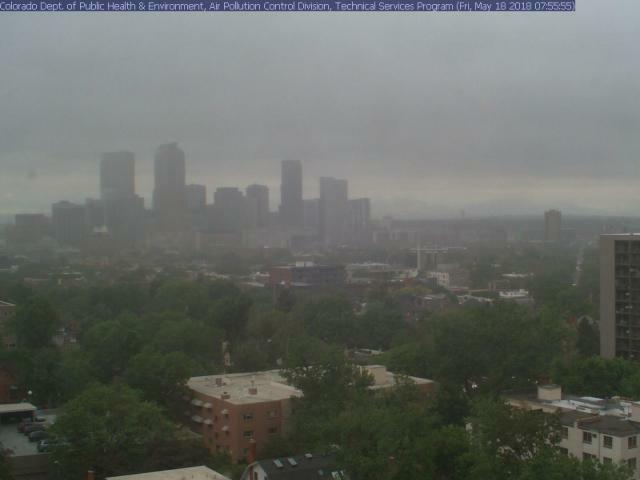 Webcam view of Denver (above) this morning shows damp clouds and fog hanging over the city, while Ft. Collins (at bottom) is wet but not foggy. 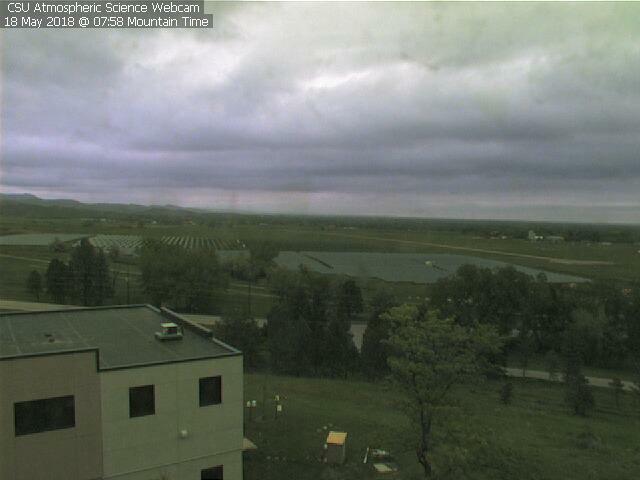 View at Ft. Collins is from the Atmospheric Science Department, looking north toward Cheyenne - both images grabbed from Jack Hales webcam wall. The GEFS QPF plumes caught my eye yesterday and again this morning. 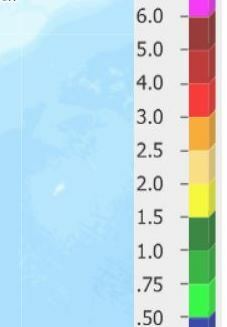 The plumes of QPF above are from 06 UTC runs and are for KDEN, which is the international airport northeast of the city. The models forecast a very wet night tonight and day tomorrow - this in the short term but note that the range of amounts forecast is about 3.5 inches. The operational GFS is by far wetter than the ensembles - over 2.0 inches difference between the operational and the ensemble mean (blue vs black). The current grid point forecast for KDEN indicates 80% chance of showers and thunderstorms tonight and Saturday but there are no mentions of possible rain amounts. The Forecast Discussion product mentions that models are all over the place and that the office will have to monitor the rain situation closely next 48-hours, but there are no watches yet, except for up in the very high mountains for winter type weather. Very unusual to see such extreme variance among the GEFS forecasts at 12 to 36-hour time frames. The GEFS plumes for Greeley (below) are even more extreme than those for KDEN. I'll keep an eye on how all this evolves. 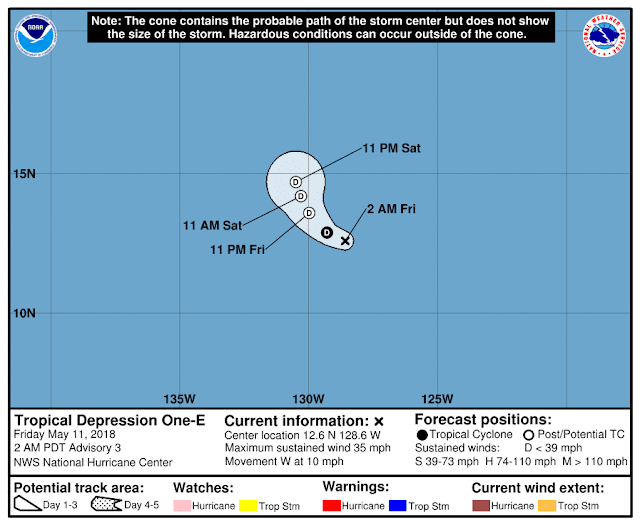 Today begins the official NHC Tropical Storm season in the eastern, north Pacific. Above is from NHC this morning with names of all storms to be used this season. Severe thunderstorms moved across the Washington D.C. area yesterday evening producing considerable wind damage. Photo above (by Anna Bella) shows a panoramic view of approaching arcus cloud. 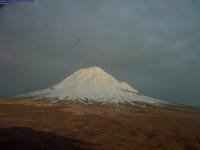 From Jack Hales webcam wall (above) is an image of Augustine volcano in Alaska this morning. 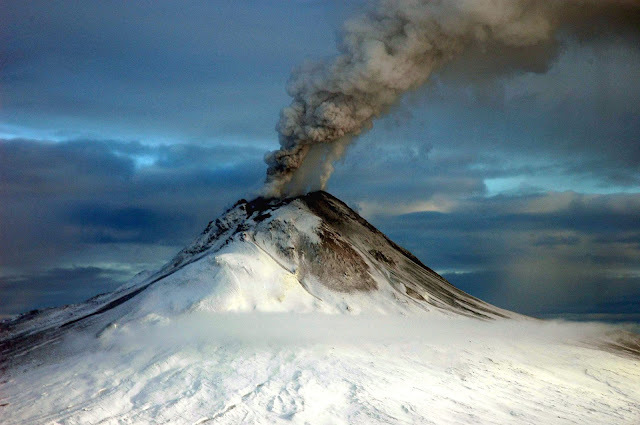 This volcano is an island in Cook Inlet, southwest of Anchorage (map below), and is shown erupting in January 2006 at bottom. Little to report as a new week gets underway - breezy/windy periods but with temperatures mostly in 90s, i.e., a bit cooler than last week. Visible satellite image above is from 6:30 am MST showing mostly clear skies across the state. There are some lenticular clouds around as there were yesterday - probably in a moist layer around 600 mb, that has strong inversion just above. Below is WRF-GFS forecast for total precipitation across the west for the period ending at 5:00 pm on May 21st (from the 00 UTC run at Atmo on the 5.4 km grid). GEFS ensemble plumes for QPF at TUS remain flat-lined. So it goes. First - past week was not a pleasant one - especially for all of us allergy suffers - seems to be the worst season in a number of years. Wind and dust and hot sums it all up. Morning view of Catalinas from campus captures some of the lingering dust, pollen, and pollution that is still hanging in our air. 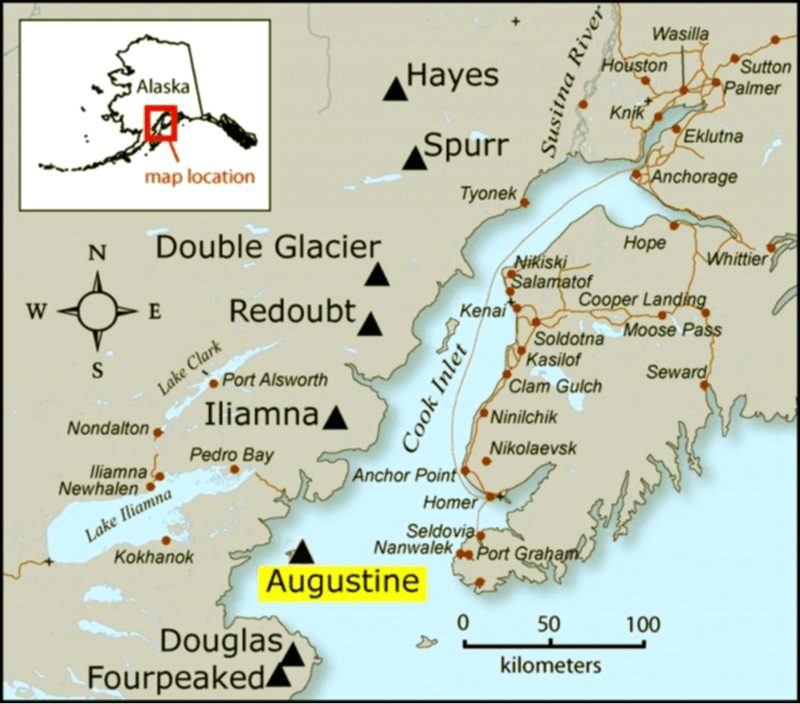 The airport reported six days with temperatures of 100 F or higher (Saturday the 5th through Thursday the 10th), while DM started on Friday the 4th and had seven days in May of 100 F and higher. Summer thunderstorm season is still far off - but definitely something to long for. 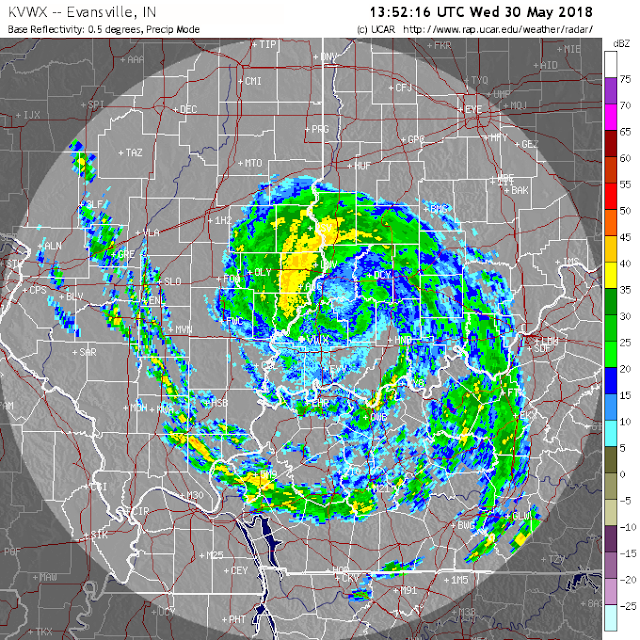 I know that this rant is futile, since no one at any management level of the NWS seems to care, but I just can't stomach inconsistent graphics, especially after the huge effort to develop high-res gridded hazard and forecast products. The NWS seems to be lagging years behind the private sector in their graphics efforts. This morning there is a Red Flag warning in effect for parts of southeast Arizona - officially the Tucson metro area is NOT under this warning. 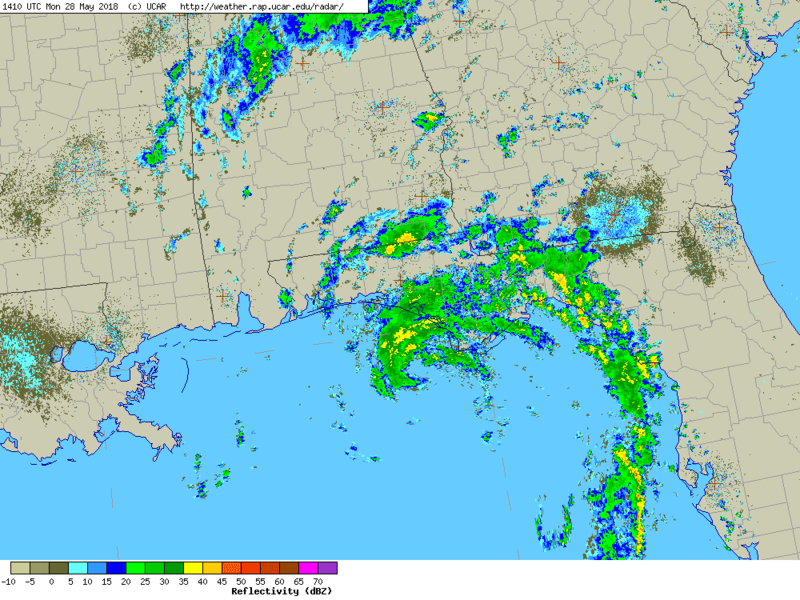 But for someone looking mostly at graphics from NWS the answer is YES it is for some click and view products. Above is from NWS Tucson homepage and shows the actually warning area - but below is also from TUS homepage and positioned right under the map above. Above is from the regional digital forecast, accessible from down at bottom of NWS TUS homepage - not sure where this graphic is generated, but it does show the actual Red Flag area. But the same product from the national hazard map (below) shows the inaccurate Red Flag area. Down at the bottom is the current grid point forecast for the airport - so official point forecast has TUS under a red flag but the official version of the Red Flag warning area does not. I'll try to shelve this particular rant for as long as I can stand looking at inconsistent products, such as these. Quick look at the regional and larger-scale situation this morning. The 10-m wind forecast above (from 06 UTC WRF-GFS on 5.4 km grid) indicates a very windy day for much of the Southwest - above valid at 3:00 pm MST. The regional Fire Weather status for today (from SPC) below indicates critical conditions over much of Southwest, as well as a small area of ISODRY (isolated dry thunderstorms). Gusty winds next several days with low humidities but with temperatures cooling some from current low 100s. So dust and wildfire alerts in effect over much of Arizona. Wind at 10-m forecasts from 06 UTC WRF-GFS at Atmo - above for tomorrow and below for Saturday at 1:00 pm MST. Strong winds over much of Arizona and New Mexico tomorrow then focus on southeast Arizona on Saturday. Since mid-February I have recorded only 0.03 inches of rain here at the house - looks like perhaps the driest three month period in my records, although spring 2002 was also very very dry. 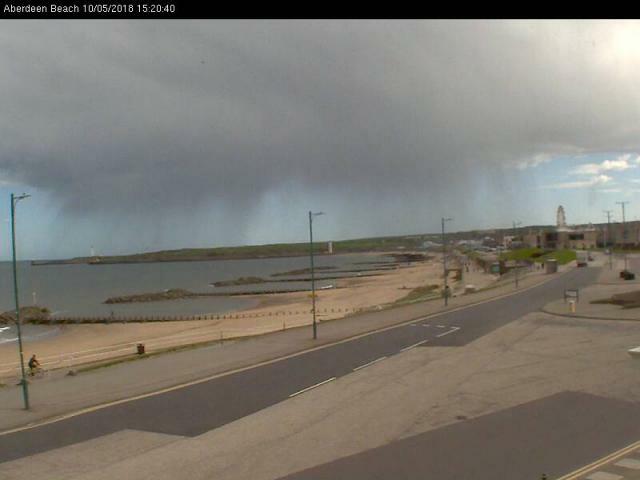 For a change from here - at bottom image from Jack Hales camera wall shows early afternoon showers approaching Aberdeen, Scotland. 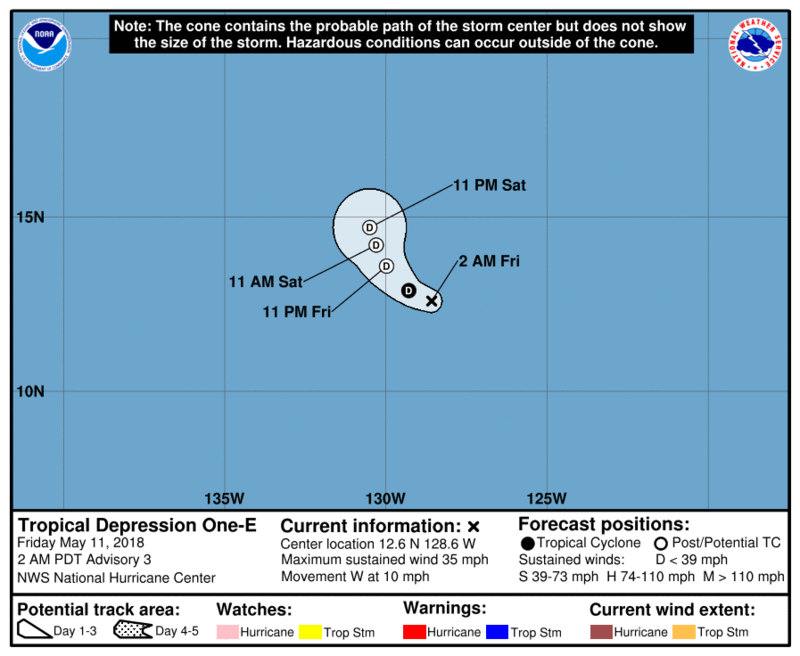 Eastern North Pacific Tropical Storm Season.